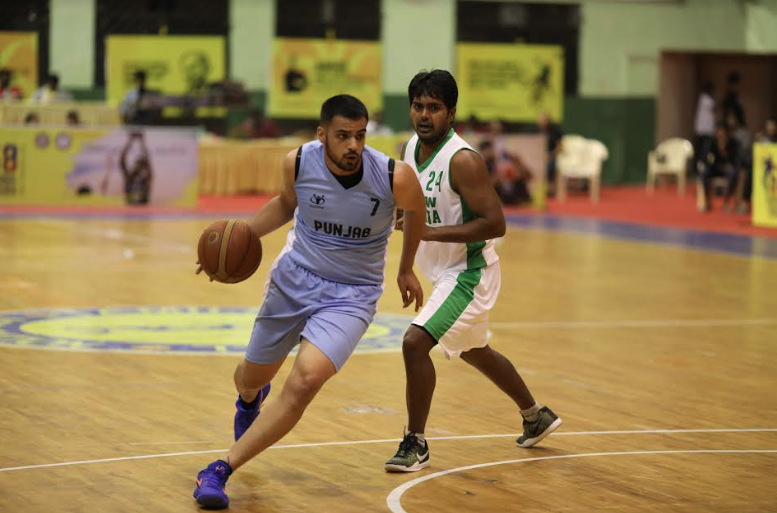 Chennai, 20th January 2018: Day 4 of the 68th National Basketball Championship for Men and Women continued to see some fast and furious action in the first half. The first game of the day the Services men’s team take on the men’s team from Chhattisgarh. The Services seemed to be in complete control from the very beginning and secured an easy victory over their opponents. The final score was 85-46. Quarter wise score – (22-13), (21-13), (20, 12), (22-08). The first women’s game of the day saw Chhattisgarh taken on Madhya Pradesh. Chhattisgarh who were in complete control throughout the game won the game. The final score was 85-69. The next men’s game Karnataka take on Odisha where Karnataka secured another comfortable victory. The final score was 78-40. Manu Thomas (jersey no 14) was the top scorer for Karnataka with 13pts. K. Sravan Kumar (jersey no 8) from Odisha was the top scorer for his team with 14 pts. The following men’s game saw Haryana take on Punjab. Punjab were dominant from the get go and secured a very comfortable victory over Haryana. While Tawinder Singh (jersey no. 9) was the top scorer from Punjab with 18pts, Ankit from Haryana (jersey no. 99) was the top scorer from his team with 15pts. Quarter wise score – (35-11), (28-04), (27-03), (15-12).